UPDATE: This loan program is no longer available. Click here to learn about non-performing loan financing options that are available today. How do non-performing loan financing and non-performing note financing work in the world of mortgage lending and refinancing? Typically, investors will already have an LLC, but a special-purpose entity will be set up, as these are business loans designed for the “repurposing” of loans which have “gone sideways,” and how to acquire those non-performing loans and make money on the back end. We run eligibility models which show us, state by state, which sideways loans can be acquired – preferably for less than the actual value of the property involved – and exactly how it can be done. An investor may say to us, “some of my notes are performing, some aren’t”. We take all non-performing loans into consideration equally. Some of our investors try to negotiate a modification agreement, and some have the objective of proceeding with foreclosure. We are looking to grow with small investors as well, who can continue to purchase more loans with us as they progress. But, we can take care of all sizes of investors. We advise on first position and second lien notes, or Fannie Mae and Freddie Mac-type loans, and how best to acquire as an investor and make them move. We set up cash flow pools for loans that can be made to re-perform, and we will hold back three months interest as a cushion for the investors at closing, in case they may have a pool of note performers. Once the loans begin to produce, and we reach a 50% loan-to-value, then we can allow a 15% leakage back to the client, with the remaining 85% going back to pay down the principal. If an investor forecloses, they take the proceeds under a three-year balloon, and can also elect to take no cash and pay off the principal. Our rate is interest-only, and ranges anywhere from 9 to 10% depending on the loan to value (LTV), whether it is a judicial or non-judicial state, and if we have more or less than 25 notes in the pool. We do charge an up-front fee of $1,500 to set up the loan and due diligence, and $325 per note, which handles all underwriting and processing – no junk fees involved – as well as an origination fee of 1.5%, which is very modest in the non-performing loan financing game. How Quickly Can You Close My Acquisition of a Non-Performing Note? Our closing time frame is 30 days, from start to close. If the client can meet our due diligence with the required paperwork, this ensures a shorter closing time frame. Our investors will review each acquisition or PSA, and if no protection can be found, we will blackline such agreements, to protect our buyers from questionable sellers. Are There Any Special Personal Requirements Involved? 12 months experience with non-performing notes and tax returns. This is not to verify your income, but history in this sometimes volatile area of real estate financing is required. We look at a combination of business and personal experience, and have put successful deals together with clients – some who do have experience with non-performing notes but no money who’ve partnered up with those who do have the necessary capital. We work equally with the seasoned investor with millions, down to those just getting their feet wet. In this non-performing note financing area, we require at least five properties to be in the financing pool, with a minimum loan size of $250,000, on a 5-year term balloon, with interest-rate indicative pricing from 6 to 6.75%, typically. We take on 1-4 units, no odd-ball type properties here. Our eligibility input model calculates the properties and the debt service coverage ratio involved. We can then immediately give indicative pricing based on these model calculations. What are the LTV (Loan-to-Value) Personal Requirements? Similar to the non-performing loan financing, when we start out in LTV, it’s 75% of acquisition cost on a purchase transaction, 75% of appraised value if the property has been seasoned more than 12 full months, as long as the cash flow can support the leverage. A 620 credit score is required, along with a non-recourse loan, no personal guarantee required. Two years personal tax returns, and four months of recent bank statements for the sponsors. Need to finance your notes? 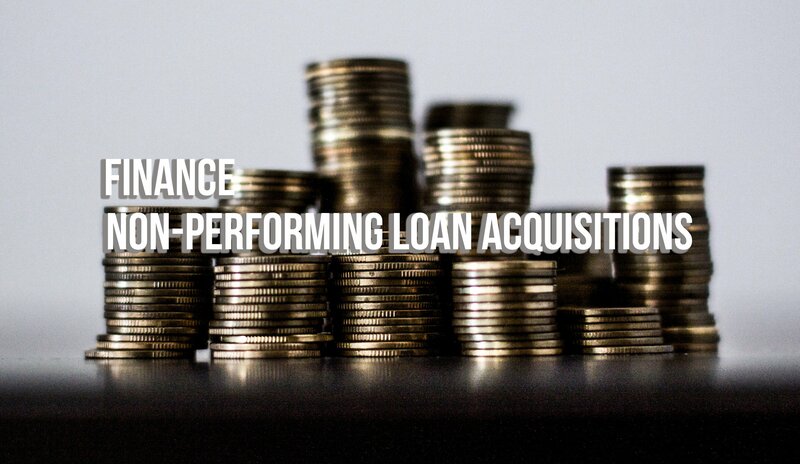 Get acquisition financing for your deals. Slightly over my head ~ I will go through it once again ~ and perhaps ~ again. I instinctively know it is of value. Quite interesting. I will evolve to this point where I can use these services. This is great. You are a genius. I am getting a lot of ideas for my business.